The perfect bull, who can find? (That’s not Shakespeare!) The elusive hunt for the perfect bull is a very difficult one but a search that every professional Longhorn producer must concentrate on, and master. 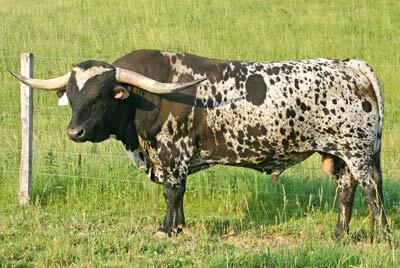 Many agree that the fastest way to fail in the Longhorn industry is using an inferior herd sire, and using him too long. 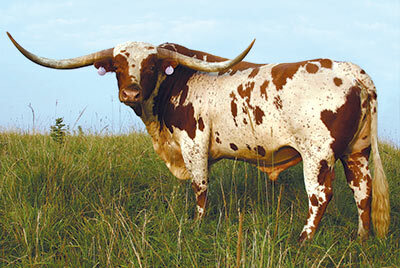 DCC is well known for breeding, producing and utilizing many of the very superior bulls in the Longhorn breed. Many of the great sires have originated from the Dickinson herd. The following bulls were bred or raised by the Dickinson family. Overwhelmer, King, Bail Jumper, Impressive, Senator, Zhivago, Phenomenon, Emperor, Not Gunna, Dixie Hunter, Jet Jockey, Don Abraham, Vision Quest, Gunner, Coal Smoke, Dixie Ruler, Don Quixote, Lethal Weapon, Measles Super Ranger, Quill, Superior, Tabasco, The Shadow, Unlimited, Over Kill, Victory Lap, Win Win, Super Bowl, Shadowizm and Winchester. The ability to spot one of these great herd sires as a day old calf is not easy. If it was easy, everyone in the industry could own their very own great sire. The whole process is a slow meticulous and tedious one. It is perhaps, sort of an art form---the important sire selection decision. There are some secrets that make it happen on a consistent basis. Let’s think about acquiring the perfect bull. At DCC we work diligently to use only the very best sires in the industry, natural service or artificial. Every pedigree is planned. Every mating is planned, studied and researched as to the potential outcome. The unknown, unpredictable, nasty and low value sire lineages have been flushed to the back of the pedigrees many years ago. We must know what every animal in every part of the pedigree represents, it's weaknesses, it's strengths and how to handle it. Long pedigrees are a key to consistency. By long pedigrees this is pedigrees of five, six and seven generations that reveal consistently high quality individuals. Strong, good pedigrees carefully omit inferior animals at least in the most recent four generations. Within the next few years there will not be a pedigree at DCC that reveals unknown, multiple sire or inferior documentation on the most recent six generations. Not only will young herd sires have a great sire and a great dam, but they will have solid grandparents, great grandparents, great great grandparents, great great great grandparents and all the way back. The pedigrees that are solidly filled with proven quality genetics for six generations will absolutely breed the highest quality cattle in the future of the industry. There are short cuts even to this plan. Line breeding done correctly increases the odds of consistent progeny. Many of the young generation DCC herd sire prospects trace ten to thirty times to Texas Ranger, two to five times to Don Quixote, and two to five times to Measles. Often two to five times to Doherty 698 and a combination of several of the proven Butler bulls like Unlimited and Superior. (The great contributions of these two Butler sires far out-weigh all other Butler bulls.) As these breed-leading animals are cautiously blended, and line bred, combining line bred blends, the strengths of these genetics just keep getting stronger each generation. Each year at DCC over 600 cows are bred to eighteen natural service sires plus numerous ones artificially inseminated. Between two and five of these resulting young bulls will be retained for DCC use. The balance of 40 of these, tested by the highest criteria, will be available for purchase. They were weighed at birth, weighted at weaning, they have had scrotal circumference measurements, rate of gain tests, horn measurements, pedigree calculations, disposition tests, all shots necessary to go anywhere and each has a very long proven consistent pedigree. Many of these young bulls are pictured on the ranch site www.texaslonghorn.com under sale cattle inventory. Prices, photos, data and extensive pedigrees are available. Many of these are so fancy, and complete with each year better than the last. The majority of these carefully selected young bulls are priced between $1200 - $2500. There will be an occasional $3500 or maybe a $6000 price on one or two. These will be absolutely phenomenal in this upper price range. Most of them are priced between $1400 - $1800. This is a price range well within the budget of any frugal Longhorn producer. Each year there will be two or three adult sires offered for sale and replaced by the younger bulls. At DCC a bull is normally only used one to three years. Some of these are currently available. Check the site. Give us at DCC a call for a quality-destined young herd sire. 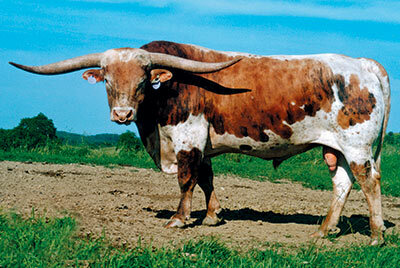 If $1200 - $1500 is not beyond your price range, and you seriously desire to raise the highest quality Texas Longhorns, we are really close to making a deal right this minute.